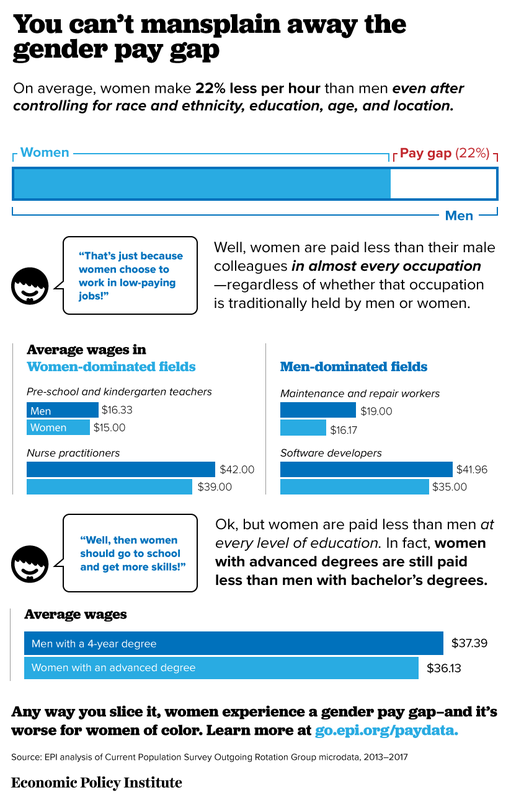 April 10th is Equal Pay Day, a reminder that a significant pay gap still exists between men and women in our country. April 10th marks how far into 2018 women would have to work to earn the same amount that men earned in 2017. On average in 2017, women were paid 22 percent less than men, after controlling for race and ethnicity, education, age, and location. While April 10th is the overall Equal Pay Day, the gaps for women of color are even larger. As compared to white men, women of color have to work even further into 2018 to make up for the wage deficit they experienced in 2017. Black women’s equal pay day is August 7th, Native American women’s equal pay day is September 27th, and Latina equal pay day doesn’t come until November 1st, almost an entire second year of working to equal typical white male wages in 2017. To close the gender pay gap, women need to see real wage growth faster than their male counterparts. The best type of narrowing occurs when both women and men see real annual wage growth. To see how much you could be earning in a more equal society, check out EPI’s Gender pay calculator.